Been a while since the last post. Been busy with work and a few shoots that I can't post yet but will soon. I got in a B&W ND filter today and thought I'd talk a little about it. The idea of this filter is to reduce exposure by 3 stops so when you are in the field and the sun is too bright you can throw this on to shoot at a slow shutter speed or more importantly, a wider aperture. In general, I'll be using these to reduce exposure to lower my aperture. I just got in my Paul C Buff Vagabond mini lithium sine wave battery so I can take my studio lights on the road. Cheaper method than just going out to by new Profoto B1's. See the link below for what I mean. So when you are on location with lights you need to keep them under a shutter speed of 1/250 s for my Nikon in order to not have a black bar going across the shot. Canon is generally under 1/200 s. See this article for more details on sync speed and shutter curtain blocking the sensor. If you want to shoot at f/4 or even try f/2.8 and your camera meter is telling you to shoot at 1/800 of a second, then you have a problem. Flash will go off, sensor will expose, but you'll get the black bar on the screen. (easy fix, just stop down to f/8 or so to get the shutter speed down below 1/250) But now you have much more in focus than you wanted. The ND filter to the rescue. See the shots below to compare them. These are both out of camera with just a conversion to DNG in Lightroom CC. You'll notice a blue shift on the one with the ND filter. Not sure how bad this is compared to other brands, but it's simply there because the filter is really dark and your in camera meter shifted the color profile just a bit. I have a really cheap 2-8 stop graduated ND filter and the shift is so bad I cannot color correct in software. So far the color correction I'd have to do on the raw file is bump it up about 300 degrees Kelvin and adjust the tint from +10 to +1. Easy fix. The shot with the filter does have a color cast to it, but it is small. Easily fixed in Lightroom. Being able to use the same lens at the same time of day and shoot at 2.8 instead of f9 makes a big difference in the depth of field. More options at this point instead of stopping down to get a good exposure. If you grab a filter, I'll give you some tips for buying. .9 means 3 stops of light. So f11 can now be shot at f4 (f11, f8, f5.6, f4). f8 can now be shot at 2.8, and so on. The filter might say 8x on it as well, meaning 8 times less light is getting through to the sensor when this is on. each stop is 2x more light. 3 stops is 2 cubed, or 8x. 10 stops is fun for blurring water or trees/grass but it's also like shooting in the dark. Don't skimp on them. These .9 filters are not cheap, so a 3.0 will cost in the hundreds. Make sure it's something you definitely need. You'll need to pre-focus your scene, screw on the filter, then take the shot. Have fun with this tool. It's an easy way to get creative when the light just isn't cutting it. 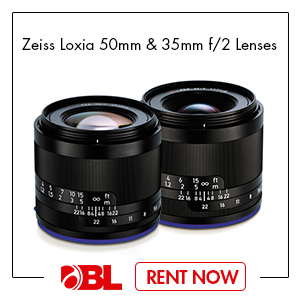 Please visit our sponsor borrowlenses.com for some great deals on renting equipment. Try before you buy is the way to go.